The idea of luring animals and birds in to be shot is not a new one and examples of carved and painted wooden waterfowl placed to attract those bird species is a practice that goes back hundreds of years. For this purpose we have decoys or as we Brits call them ‘deeks’! Hunting consists of two simple requirements. Firstly the hunter has to get near enough to their quarry to kill it, secondly and if that is not possible they have to entice it closer! Obviously camouflage can be useful in keeping the shooter and their equipment hidden. But the modern decoy industry is more far reaching and innovative than that and is not just restricted to bird hunting. 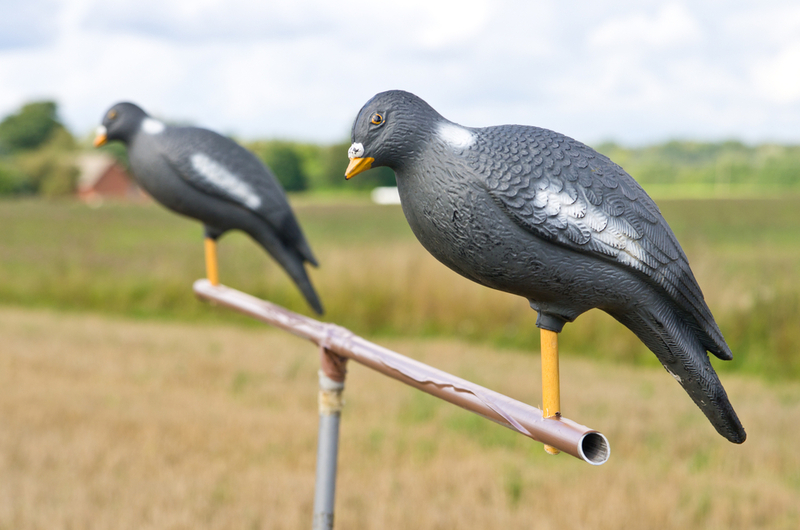 Take pigeon shooting as an example. The basic deek is a life-sized and realistic representation of the bird made out of pressed plastic. They are normally set on short sticks, which allows them to pivot and rock so giving the impression of being alive when viewed from above. Set out in a pattern that simulates them feeding in a field, other birds will see it and hopefully come down to join the feast. However, there are many variants with electric-powered models that act like they are coming into land or feeding. Also ‘pigeon magnets’, which is a device with articulated arms that dead pigeons are affixed to. It spins round and mimics birds circling to land. Other deeks can be used for different species as for example crows will attack an owl decoy. Foxes too are very curious and there are a number of devices generically called ‘wigglers’ that use either a life-like model of a rabbit, or similar, or a piece of fur over a frame that is electrically powered and moves (wiggles) that will attract them into shooting range. Electric calls that hold a number of pre-recorded animal sounds are also popular for animals. In the UK however, the law does not allow them to be used to entice birds, though hand and mouth blown calls are legal; go figure! These are primarily used by fox shooters and top choices are rabbit and hare sounds in distress, as foxes are born opportunists and will never pass up a free meal. However, you can also pique their inherent curiosity with other sounds like a vixen calling to mate, pups yipping and similar. However, you soon learn not to over use them and also vary the calls as foxes are not stupid. Equally if you use one and miss then it’s doubtful if Mr Fox will fall for it twice! Scent and taste lures can be used be it for deer with attractants simulating females or simple salt licks that brings them in. Some of the more sophisticated wigglers incorporate scent chambers with fans that blow the smells out. Like most things shooting, the decoy industry, hand-in-hand with the pest controllers and hunters is a large and lucrative one. It seems that every month new and varied products are appearing. And they are happily taken up by both sport shooters and the professionals alike. Some don’t work others can be too good! For example the pigeon magnets when they first appeared were massively successful and a lot of birds were killed, these days they are not so effective. However, you can go down market with equal success as squeaking using your mouth pressed into your palm is equally effective on foxes. Or shaking a half box of matches will imitate a magpie’s chatter well.